Bad photo of a pretty cabochon! 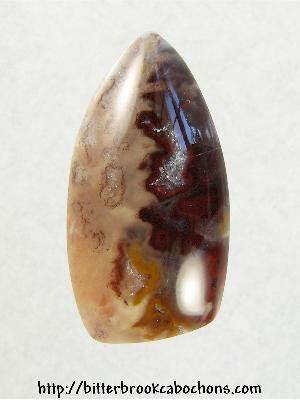 This Alabama Paint Rock Agate cab has lots of tiny drusy crystals scattered about, with one big area at mid-right. Mostly matrix-y on the left, with dark reds on the right, including underneath that big reflection at lower right. 32mm x 16.5mm x 6mm. Weight: 23.60 carats.